Erin Koch’s Free Market Tuberculosis: Managing Epidemics in Post-Soviet Georgia (2013) provides an engaging and conceptually stimulating portrayal of the transition, in the late 20th and early 21st century, from Georgia’s Soviet style of tuberculosis (TB) care to globalized and neoliberalized Directly Observed Treatment, Short-Course (DOTS). Extending existing literatures concerning the effects of neoclassical economics on subjectivity and healthcare, Free Market Tuberculosis is an important contribution to critical medical anthropology’s emerging discussion of globalization, infectious disease, biosocial perspectives on disease, and political economy. Koch examines Georgian TB services as a window on global processes of standardization and—inspired by Georgia’s geographical position as a crossroads—investigates DOTS as form of standardization mediated by local practices and history. The text integrates ethnographic accounts of field engagements in zones of knowledge—pediatric wards, sputum smear microscopy laboratories, and prisons—that contest DOTS’s processes of commensurability to “…highlight contingencies and contradictions that emerge amid standardization at the intersection of different political economies of care” (p. 88). After an informative introduction to TB treatment and science, Koch argues that her ethnographic work in early 2000s Georgia is illustrative of the twinned global health strategies of standardization and neoliberalization. She locates these practices in Georgia’s transition to a de-centralized economy or the “free market.” Though she leaves the question of “the market” open, Koch takes up the first half of the term and focuses on freedom as a critical lens. She leverages the concept of neoliberal freedom to trace the effects of DOTS as a “technology of subjectivity” for patients, doctors, prisoners and everyday Georgians. She examines the double binds of standardization and freedom by attending to two primary transitions: 1) the change from a planned economy to a free market, and 2) the shift from Soviet health care and active case finding to global health and passive case findings. In each case her text examines the tumults of transition, to examine political ideologies of health care lain bare by TB treatment, soviet and capitalist. Early chapters convincingly argue that state care and global geopolitics are best understood as integral parts of each other. In each case, Koch focuses on a contradiction that reveals how the intersection of an unplanned economy and DOTS’s medical standardization does not necessarily produce increased freedom. With DOTS standardization, Koch argues, come new technologies of knowing the body and a “shifting status of expertise” (p. 109). To support these claims, Koch shares the experience of doctors working to care for patients. Her examples show that DOTS has eroded the role of physician expertise and reduced each physician’s ability to individualize care as each TB patient becomes a commensurable biomedical subject. She explains: “Many physicians who were trained under the Soviet model point out that the surveillance of the DOTS protocol is, ironically, more stereotypically Stalinist in its implementation than the former system” (90). Koch follows a similar tack on patients. She suggests that logics of passive case finding and fee-for-service care work to discipline rather than free subjects. The free market for health care is, in Koch’s analysis, a market-based mechanism to promote what she calls neoliberal forms of self care and risk reduction. In both cases Koch sees DOTS as a “technology of subjectivity.” She describes the interactions between existing forms of subjectivity and DOTS to understand how contradictions like the ones around “freedom” permeate not just forms of being and doing around TB, but ways of experiencing and knowing the disease as well. Koch focuses on two particularly illuminating aspects of this irreducibility. The first relates to the types of containers that carry sputum samples to the lab, and the second concerns the temporality of bodies and bacteria. Koch recounts a fascinating ethnographic moment in which samples from the general population arrive in used jelly jars and plastic tubes from institutionalized prison populations. She analyzes this as one example of the ways external social forms enter the lab. In the second example, she shares moments in which bacteria and technology come together to undermine attempts to routinize time and better manage labor; she references the bacteria’s slow growth rate and the ocular fatigue of the women looking in the microscope to present a picture in which local knowledge suggests that the amount of bacteria in a sample can at times become an index of disease severity. These processes and contingencies suggest to Koch that, “clearly microbes do not simply shape social aspects of infection and treatment; local cultural politics of science (and biomedical) expertise also shape the status and meanings of microbes, and how they relate with laboratory cultures, bodies, and protocols” (p. 149). In the final body chapter Koch engages with an additional problematic space for standardized DOTS therapy: the prison. Following on the preceding chapter’s problematization of sputum, Koch outlines a fascinating economy of TB-positive sputum in Georgia’s prisons in which sputum becomes a commodity traded among prisoners to access a TB facility with considerably better carceral conditions. She traces an English loanword, “cheated,” from lab to prison. Along the way Koch tries to understand the multiple discourses at work as prisoners, TB workers, and prison workers participate in an economy of care and sickness. Throughout the chapter, she continues to trace the values and anxieties that a carceral/TB care economy raises for international aid workers, Georgian bureaucrats, and public health workers. Koch concludes with a short discussion aimed primarily at global health practitioners. She re-states her thesis about standardization but unpredictably ends the text with a discussion of one of TB’s binary propositions, namely, a difference in priorities between latent and active forms of TB in the body. She suggests that the global health world take a critical look at this binary, and builds a foundation for contemporary work on TB that troubles the temporal relations embedded with TB care. The text is, at times, a conceptually dizzying array of possibilities. Koch raises more ideas and concepts than she has time to fully examine. Instead, the book is a kind of bricolage of small sections bound, at times tightly and at others loosely, to one another. In the same vein, her strongest arguments must be read into the text. She engages technologies of subjectivity but gives her reader little guidance about what subjectivity may mean for her, her Georgian colleagues, or Georgian TB patients. Similarly, Koch’s use of the word market in the text’s title goes unexamined. This omission is particularly striking, as the text traces TB’s transitions along with market transition. In Koch’s post-Soviet context a discussion that helps the reader think past his or her own conceptions of the market could be fruitful, especially as Koch views market forces as important parts of the local microbiological dynamics and standardizations. Indeed, her book sits in a middle space, traversing conversations in global health and medical anthropology, though I think too often she remains in global health. Nonetheless, her work informs my own TB care in contemporary India. In India, early 1990s liberalization and revision of the National TB Control Program have built a strikingly similar context in which state provision of care takes place within a set of complex free market forces. Indeed, Koch’s focus on DOTS as a global strategy points to common problems faced outside of Georgia, including the programmatic preference of sputum smears over chest x-rays, the shifting value of expertise, and the free availability of pharmaceuticals. Her text also helps chart a dynamic relationship between private and public provision of TB care, and she presents a well-grounded and multi-axial consideration of how standardization affects all actors involved in TB care, not just patients. Free Market Tuberculosis has influenced my own work, inspiring me to think more about the effects of biocapital and pharmaceutical markets on knowledge and care provision in the private sector, as well as the effects of markets for health and healthcare products on the creation of diagnostic knowledge—particularly in an Indian context where empirical diagnosis is common. Free Market Tuberculosis is geared toward a specialist audience, but has much to say for those interested in post-socialist transition, neoliberalism, and global health. It is situated deeply within a critical medical anthropology canon and was one of the first in-depth ethnographic studies of global health to emerge in the field. Though her analysis can stray from ethnographic richness, these diversions spark a flurry of ideas in the mind of any interested reader. Koch’s work might be productively read in conversation with Keshavjee’s consideration of neoliberal transformation in Tajikistan in The Blind Spot: How Neoliberalism Infiltrated Global Health (2014) and Ian Harper’s Development and Public Health in the Himalaya: Reflections on healing in Contemporary Nepal (2014). Andrew McDowell is a postdoctoral fellow in Social Studies of Medicine, and Epidemiology and Biostatistics at McGill University. An anthropologist, his research explores the practice of medical care in India with a focus on tuberculosis, unlabeled pharmaceuticals, and the margins of biomedicine. Building on previous research that examines local biologies of global TB among rural low-caste Rajasthani TB sufferers and their caregivers, his current work—in Mumbai’s informal settlements and the clinics of physicians who practice there—strives to outline knowledge practices around diagnosis and ethical practice. Harper, I. 2014 Development and Public Health in the Himalaya: Reflections on Healing in Contemporary Nepal: Taylor & Francis. Keshavjee, S., and P. Farmer. 2014 Blind Spot: How Neoliberalism Infiltrated Global Health: University of California Press. Koch, Erin. 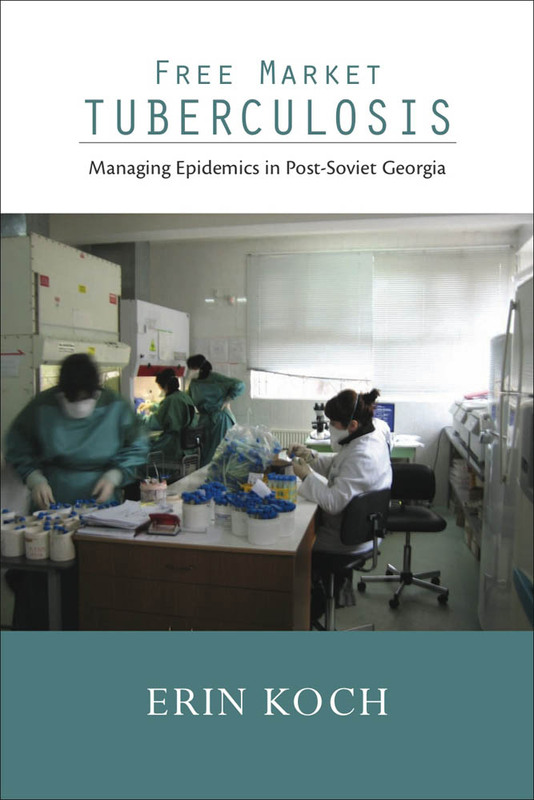 2013 Free Market Tuberculosis: Managing Epidemics in Post-Soviet Georgia. New York: Vanderbilt University Press. Lock, Margaret. 1993 Encounters with Aging: Mythologies of Menopause in Japan and North America: Berkeley: University of California Press. Mcdowell A. Erin Koch’s Free Market Tuberculosis. Somatosphere. 2015. Available at: http://somatosphere.net/2015/free-market-tuberculosis.html/. Accessed April 20, 2019. Mcdowell, Andrew. 2015. Erin Koch’s Free Market Tuberculosis. Somatosphere. http://somatosphere.net/2015/free-market-tuberculosis.html/ (accessed April 20, 2019).